This infuser water bottle by Infuzeit is pretty nice. I love the drink spout and locking top. The built in grips on the side are great for no slip drinking, or chugging depending on how you enjoy your water. The size of the bottle is a great size for water. I find 20 oz a bit small while 32 oz is just about right. I love that I can put ice in the bottom to keep my drink cool and still be able to use the infuser for great tasting flavor infused water. I see this making its way around town quite a bit with me. Even though this box was immaculate the top of my water bottle has a crack in it. They will be sending me a new undamaged one, but even with the damage I can see how well made this was and know that this was a defect during packing that was not caught. 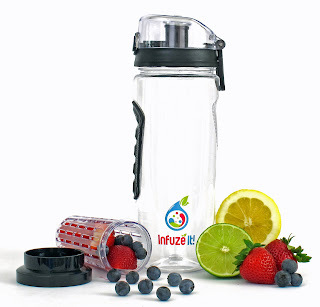 You can find this Infuser water bottle on Amazon. What Infuzeit has to say about their product. With your Infuze IT! water bottle, you can drink FLAVORFUL water all day long just by adding fresh FRUITS and HERBS. Most people don't drink enough water on a daily basis. Drinking water is ESSENTIAL to staying healthy. Whether you want FEEL better or LOOK better, drinking water that has been INFUSED with fresh fruits and herbs will help you get your RESULTS you are looking for. Commercially available drinks are full of COLORING, CHEMICALS and SUGARS. Stay AWAY from them and create your own FLAVOR SPECTRUM with your own recipes. 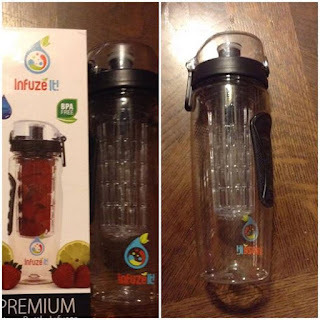 Disclosure: MarksvilleandMe received one or more of the products mentioned above as part of a promotion with Tomoson and Infuzeit. Regardless, MarksvilleandMe only recommends products or services we use personally and believe will be good for our readers. Some of the links in the article may be “affiliate links.” This means if you click on the link and purchase the item, I will receive compensation. If you would like MarksvilleandMe to review a product or service please contact us at marksvilleandme@gmail.com.